It could be a good while before those of us in the West get to sample the delights of Professor Layton and the Azran Legacies, apparently the final adventure with the famous hat-wearing puzzle solver. It arrives in Japan in just a few days, so as a result the promotional videos are going into overdrive. Although most won't understand the text or voice acting, the latest trailer for the title does provide insight into the variety in settings that this adventure will use, with what looks like an increasingly interesting mix of scenarios. 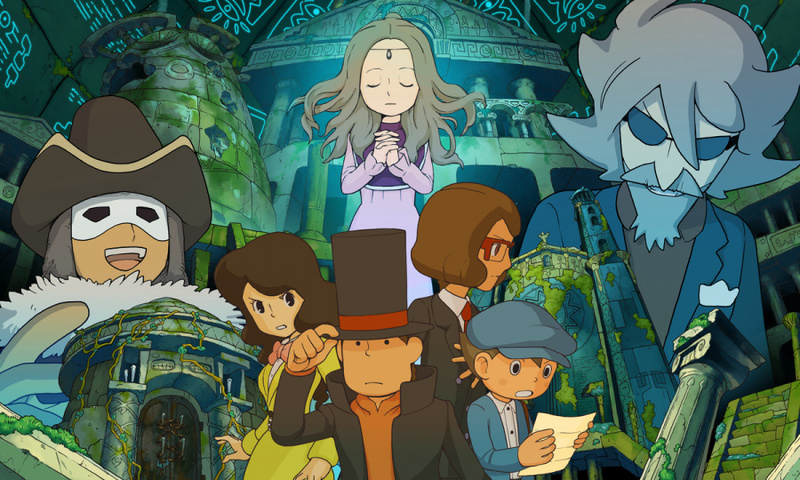 The footage shows some intriguing cut scenes as well as a healthy dose of some of the puzzles that can be expected; the gameplay seems to follow the basics laid down in Professor Layton and the Miracle Mask. We wouldn't say that the footage has any spoilers as such, but if you're still playing through the earlier games and getting up to speed with the over-arching storyline, you may be well advised to avoid. It may be late this year or even 2014 before this is localised, but let us know what you think below, in any case. Be aware The Professor Layton Trailers always show some of the final cutscenes in their trailer. Mostly because the game doesn't get that visually intense until then. Wow, this looks pretty good. The first few seconds gave me chills. I have to say I was a bit disappointed by the Last Specter and the Miracle Mask but this could very well reveal itself to be just as good as Unwound Future! I still have 4 more Layton to play. I've only beaten Curios Village, need to get all the others. Ohhh love the music of the trailer . This looks to have a suitably grand scale for Layton's final adventure. Hope we can get our hands on this after 7 months or so. So this'll be the last game? That's unlike Nintendo to just end such a good franchise and never make another Layton game again. Maybe they'll make another game series taking place in the future starring Luke Triton as an adult solving mysteries...? Last in the series? Well, considering localization is usually a pretty lengthy affair, I'll be using this time to catch up on the series. Ugh. I love these games so much. Gonna be this October, then October 2014 for PL vs. PW. I think. I haven't touched my 3DS since I beat Miracle Mask. I want this game! Miracle Mask was great, had some beautiful cutscenes. However the in game character visuals were somewhat blocky and outdated. The use of touch screen was used strangely in my opinion. Still giving my full respect for the series quitting while it's ahead. (Assuming they actually carry through with this) It'll be sad to see it go, but at least we'll always remember them as great games as opposed to continually buying the ever new worse versions. @MultiMariosonic Nintendo neither makes or owns the rights to Layton, they just publish it in some territories for Level-5. Why does this have to be the final one! The series is one of my favourites and it will be sad to see it go. I think Level-5 specifically said this would be last game starring (or featuring) Professor Layton. At the end of Unwound Future (which is the last game chronologically in the series) it says "to be continued..." I'm not sure if they meant the series would continue through the prequel trilogy that came after Unwound Future or that there would be a new game chronologically after Unwound Future when Luke moves away at the end of the game and talks about a new adventure he wants Layton to join him on. So it could be that the next trilogy features Luke as the main character with possibly Layton joining in at times. I enjoyed Miracle Mask, though I'm probably not going to bother with the DS games. I'll definitely nab this one though. I'm quite sad to see one of my favorite series go. However, like some of you mentioned before, I wouldn't be surprised if a spin-off is made. No matter what, though, it just will not be the same without the professor. I've lost track of how many games there are in this series. What is this, the 5th or 6th game? If they ever release a compilation, then I might be interested. I admire Level-5 for having the Prof. end with a bang and not drift into obscurity like some other games.